Proper installation of a wood-fired heating system is necessary for clean and efficient operation and for safety. Improperly installed wood burners and chimneys are a major cause of house fires. Most states have statewide fire code standards for stove installation, usually overseen by local building code officials. Always follow manufacturer’s instructions as well as state and local building codes. Pay particular attention to clearance from combustible surfaces. It is advisable to have professional help in choosing and installing a wood-fired heating system; however, the following information is provided as a general guide. This information is not exhaustive. Check your owner’s manual and local building codes for detailed information. When in doubt, seek out a professional wood stove installer. Your stove should be located in a frequently used, central area, such as the living room or family room. When you have decided on a location, inspect the structural support under the floor on which the stove will be placed to make sure it is adequate. The most efficient heating place for a stove is in the center of the room, where it can radiate heat in all directions, however you should also consider the use of the room. The least efficient place to put a stove is in a closet or alcove, so consider where you can install the unit so it will be safe (both in distance from combustible surfaces as well as out of the way of the homes flow or traffic movement). Installation requires proper clearances between stove system surfaces and their surroundings to keep your home safe from fire. Remember: heat transfer from the walls of the stovepipe and chimney, as well as from the stove itself, must be considered. A noncombustible material is defined as one that will not ignite or burn when subjected to flame or intense heat for extended periods of time. Steel, iron, brick, tile, concrete, slate, and glass are noncombustible. All walls containing wood framing are combustible – including plaster and sheetrock walls on wood lath or on wood studs. Nearly every wall and ceiling in residential buildings contains wood. Constant exposure to heat lowers the temperature at which a combustible material will begin to burn. A joist or rafter too close to the chimney walls, or a wall stud too close to the stove and its stovepipe, will overheat and ignite over time. Therefore, it is essential that the stove be installed with adequate clearance from combustible materials. If you are unsure about the construction of your home, assume that the wall or ceiling is combustible and maintain proper clearance. A floor is considered noncombustible if it is concrete, slab-on-grade design, or solid concrete with steel or concrete—but not wood—supports. An existing masonry hearth extension is noncombustible if no wood forms have been left in place below it, and if stove placement allows at least 18 inches of hearth extension in front of the loading door. All wood floors, carpets and synthetic materials are considered combustible and must be protected in an approved manner. Other combustible materials include furniture, draperies, books and clothing. All stoves and stovepipes require a minimum clearance to unprotected combustibles on top and on all sides of the wood stove. Clearances are specified by building codes to prevent overheating of combustible materials by keeping them at a safe distance from the stove and its components. Required clearances for stoves and stove parts from all combustible materials like walls and furniture can be found on the certification label for safety test standards or in the manufacturer’s installation instructions. If performance is unknown such as on uncertified stoves, minimum required clearances to combustible materials are very large: 48 inches for radiant stoves and 36 inches for stoves surrounded by jackets behind which convection air can flow. If you install a stove for which there are no instructions, you should observe state building codes. The clearances listed in this guide may also be useful. Manufacturers of EPA-certified stoves are required to specify minimum clearances. These clearances vary, depending on the construction of the stove. If there is no label, the stove is not EPA-certified. Some insurance companies will only accept EPA-certified appliances. Also, be aware that failure to properly install your stove may nullify your insurance policy in the event of a house fire. No clearance is needed for stoves or stovepipes to noncombustible walls (i.e., concrete walls or dirt floors). It is a good practice, however, to allow six inches or more for good air circulation and heat dissipation. State and local building codes and clearances listed in this section should be observed when manufacturer’s installation instructions are not available. When manufacturer’s instructions are available, compare the recommended clearances with state and local building codes and those listed here. Always adhere to the building codes and manufacturer’s specifications as a minimum; using a larger clearance will provide a margin of safety, but never go smaller than what they recommend. Unprotected floors, walls and ceilings. All stoves require a minimum 36-inch clearance to unprotected combustibles above and on all sides of the stove. A single wall stovepipe must have a clearance to combustible walls and ceilings, measured at right angles to the pipe of at least 18 inches. No clearance is needed to noncombustible walls (i.e., concrete). It is good practice, however, to allow six inches or more for good air circulation and dissipation of heat. The only base on which a stove can be installed without special protection is a noncombustible floor or properly built hearth extension. Such a base should extend at least 18 inches on all sides of the stove. A wood stove and stovepipe may be placed closer than 18 inches to a combustible material if the material is protected in an approved manner with either a home-built or prefabricated clearance-reduction system. The two most common types of home-built clearance-reduction systems use 24-gauge sheet metal (galvanized steel, aluminum, or copper) or 3-1/2-inch-thick (4-inch nominal) masonry wall. 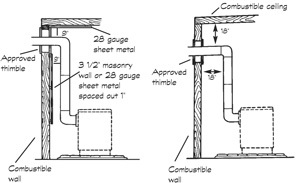 Either of these materials must be spaced out one inch from the combustible surface; that is, they must be anchored to the combustible surface so that there is an air space between the sheet metal or masonry and the combustible material of at least one inch. With sheet metal, noncombustible spacers are used to maintain the one-inch air space. With a masonry wall, metal wall ties and furring strips, if needed, are used to anchor the brick to the wall. Do not place the spacers or wall ties directly behind the stove or stovepipe. The one-inch air space must be maintained around the entire perimeter of the clearance-reduction system so that air flows freely and removes heat. This prevents the combustible surface from catching fire. Sheet metal or masonry attached to the wall without this air space offers no protection and cannot be considered a clearance-reduction system. 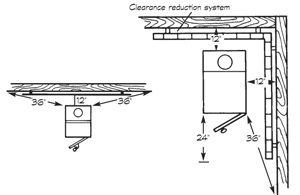 A clearance-reduction system provides a ventilated airspace between a heat source and combustible material, spaced out one inch from the combustible surface. Installing a clearance-reduction system will reduce heat transferred to the combustible surface, allowing specific clearances to be lowered. A variety of prefabricated clearance-reduction systems are available through wood stove and fireplace dealers. Always look for the safety listing and make sure the system is designed to be used with a wood stove. The manufacturers of these tested and listed accessories provide specific installation instructions that must be followed. The clearance-reduction system must be centered behind or above the stove and stovepipe to protect the wall or ceiling, respectively. The system should extend at least 36 inches past the stove in height and width, measured diagonally. If the stove is placed farther from the wall than the minimum distance required, the width and height of the clearance system can be determined by measuring from the side and top edge of the stove to the unprotected wall. This distance should be no less than 36 inches. The larger the distance between the stove or stovepipe and the wall, the smaller the clearance-reduction system needs to be. Some manufacturers may specify greater clearances. For a complete listing of clearances using clearance-reduction systems, contact your local fire marshal’s office. All combustible floors must be protected. The only base on which a stove can be installed without special protection is a noncombustible floor or properly built hearth extension. Manufacturers of listed stoves usually specify the type of material required for floor protection. If the manufacturer does not specify a material, you may purchase one or more of the safety-tested and listed prefabricated stove boards on the market. Floor protection should extend at least 18 inches in front of the loading door to prevent damage to the floor from sparks, embers, ash or radiant heat. It should also extend 18 inches or more on the remaining sides of listed stoves, unless the manufacturer specifies a greater amount. An unlisted stove requires at least 18 inches of floor protection on all sides, including the loading and ash doors. If more than one safety-listed prefabricated stove board is needed to meet the clearance requirements, the junction between the stove boards should be made using either a safety tested and listed stove board adapter or a strip of 24-gauge sheet metal four to six inches wide. The type of floor protection recommended depends on stove leg length. Stoves with legs less than two inches in height must rest only on floor protection as specified by the manufacturer, safety tested and listed prefabricated stove boards, or a noncombustible floor. Stoves with legs two inches to six inches: Floor protection can consist of four-inch (nominal) hollow masonry laid to provide air circulation through the layer and covered with 24-gauge sheet metal. Another layer of masonry may be laid over the sheet metal for aesthetic appeal. Stoves with legs higher than six inches: Floor protection can consist of closely spaced masonry units of brick, concrete or stone that provide a thickness of not less than two inches. Such masonry must be covered by or placed over 24-gauge sheet metal. If you use a combination of sheet metal and masonry for floor protection, be sure that each stove leg has a firm, solid footing. Stack effect, or the “cold hearth syndrome” – At standby with no fire in the stove, a house that is taller than the chimney can act like a better chimney than the chimney itself. This so-called stack effect is created by (rising) warm air in the house creating a slight negative pressure down where the stove is, and because the chimney is shorter than the house, it cannot compete. Hence, the flow direction in the chimney is reversed, flowing backwards and pulling cold air, and potentially exhaust, into the house. Chimney height is critical to creating proper draft. The chimney must extend at least three feet up from the roof and be at least two feet higher than any part of the roof within ten feet, measured horizontally. Measurements are made from the high side of the roof to the top of the chimney wall. If your chimney is 10 feet or more from the roof ridge, you may use the chart below directly. If the ridge is closer than ten feet, calculate the proper height by using the numbers from the chart above in the following formula: (roof slope x distance to ridge) + 2 feet = required height above the roof. For example, a chimney on a 5/12-slope roof located 6 feet from the ridge requires: (5/12 x 6 ft.) + 2 feet = 4 feet, 6 inches above roof. The chimney connector or vent connector is commonly known as the stovepipe. It connects the stove to the chimney. 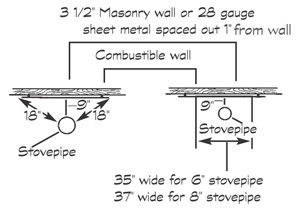 A stovepipe may have a single or double metal wallconstruction. Double wall offers better protection and many home insurers require this feature. It may not pass through a wall, ceiling, attic, closet, or any concealed area. Studies show that most house fires related to woodfired heaters often originate around the chimney or stovepipe. According to the U.S. Consumer Product Safety Commission, house fires involving chimneys are caused primarily by creosote buildup in the chimney (creosote is soot and tar produced as a by-product of wood burning), metal chimneys too close to combustibles, chimney failure, improper construction or deterioration of a masonry chimney, and improper installation of a chimney connector (stovepipe). Before building or installing a chimney and stovepipe, it is very important to contact the fire marshal’s office and the local building code officials for information on making your system safe (in many areas, the installation will have to be inspected by the local building codes official). For safety reasons, the stovepipe should be as short as possible, but installations with five feet or so of pipe are acceptable. Keep in mind that the most trouble-free system will have few, if any, horizontal pipe sections and elbows. A vertical stovepipe gives the best possible draft and allows creosote and soot to fall back into the stove to be burned. Long runs of stovepipe and elbows should be avoided because they inevitably fill up with soot, ash, and creosote. *Roof slopes are given in feet of rise per 12 feet of run. A 6/12 slope rises 6 feet per 12 feet of horizontal run. Use a metal or fire clay thimble when passing a stovepipe through noncombustible walls. The thimble should be permanently cemented into the masonry chimney and extend through the chimney wall to the inner face or liner, but not beyond. Push the short section of stovepipe, crimped on both ends, into the thimble and secure it with high-temperature sealant. The stovepipe should extend as far as possible into the thimble, but should not stick out into the chimney. If you must vent through a combustible interior or exterior wall, contact the fire marshal for instructions. A stovepipe may never pass through a ceiling, closet, or concealed area. For these situations a “Class A” chimney is required. Once the stovepipe connects to the chimney, it must remain a chimney from that point on. No further use of stovepipe is allowed. Whether to have a metal or masonry chimney depends on a number of factors. Both types have advantages and disadvantages. Metal chimneys are often less expensive than masonry chimneys and are more adaptable to installation in existing houses. (Some insurance companies, however, will not approve coverage for homes with a metal chimney; be sure to check with your insurance company before installing a metal chimney.) Most masonry chimneys require the work of an experienced mason and are usually built at the same time as the house. Masonry chimneys require a cleanout opening, which provides a convenient way to remove creosote after a cleaning. The opening should be more than two feet below the stovepipe entry port, should be made of ferrous metal frame, and must have a door designed to remain airtight when the stove is in use. A chimney cap is often added to keep out rain. On masonry chimneys, a flat plate of steel or concrete is most often used, but more stylish ceramic and metal caps are available. Caps for safety-tested and listed manufactured chimneys are also available. Masonry chimneys are very durable, and some homeowners consider them more attractive than prefabricated chimneys. In addition, massive interior masonry chimneys will store heat longer and continue to release this heat to the room long after the wood fire has subsided. Masonry chimneys also have disadvantages. They are expensive to build and more difficult to inspect and maintain than prefabricated chimneys. Masonry chimneys that are built on exterior walls reduce heating efficiency. This exposure to cold outdoor temperatures leads to greater heat loss and higher accumulations of creosote deposits. Whether you have a masonry chimney built or plan to use an existing one, safety should be your prime consideration. A masonry chimney is a very heavy structure that must be able to withstand many years of use, including occasional chimney fires in which temperatures may reach 2,700°F. Make sure the stove will have enough air for combustion and proper draft for that size chimney. Check the general condition of an existing chimney. Look for loose bricks and cracks in the mortar that might allow creosote to leak out or sparks to escape and ignite creosote or dry structural wood. Have a competent mason do any needed repairs or add a chimney liner. Many older homes have chimneys that are in good structural shape but do not meet “all fuel” or “Class A” requirements. 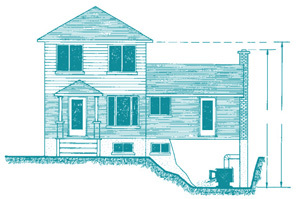 A typical example is a chimney constructed of four-inch brick without a fire clay liner. These chimneys can be made safe by lining them with safety-listed liners. Each wood-burning appliance must have its own flue (a fireplace is considered an appliance). If you have more than one fireplace, check the chimney to make sure that a flue exists for each appliance. Frequently in older homes, an existing masonry chimney may have served more than one appliance in various rooms. It is critical to locate and seal these unused entry ports or breachings. Unused breachings are often covered with a thin metal “pie plate” cover. They may be hidden by paneling or plaster, especially if the house has been remodeled. Unused breachings should be sealed using masonry and fire clay mortar to make the former entry port as sound as the rest of the chimney. All chimneys require regular inspection for deterioration and creosote buildup. Even a correctly built chimney can settle and require repair within time – a poorly built chimney is dangerous from the start. The chimney should be inspected and cleaned at least once a year, and as often as biweekly if you use your wood stove daily. Also, disassemble the stovepipe and inspect it. Creosote should never be allowed to deposit more than one-quarter-inch thick on the chimney or stovepipe. Inspect the flue at both the stove end and chimney top. Remember that cooler surfaces will have the thickest creosote deposits (these are usually near the top). You can have a professional clean your chimney or you may choose to clean it yourself. If you do it yourself, wear a protective mask and goggles and gloves and use a quality steel-bristle brush. You’ll also need to clean the inside of the stove and stovepipe. If you suspect leaks or cracks in your stove system, call in a professional to perform a leak test. If any leaks are found, have them repaired immediately. If a chimney passes through an attic area it is essential this is inspected every year for cracks. Depending on the state you live in, state and/or local building codes may require an outdoor air inlet to ensure adequate air for combustion. 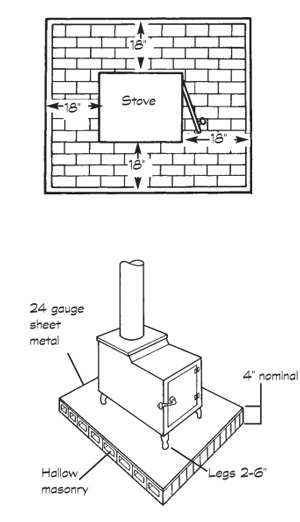 The size, design and location of the inlet required depend on a number of variables, such as type and height of the chimney and heating size of the stove. Check with your building code officials. Without an outdoor air supply, your stove will take combustion air from the room, creating the potential for dangerous back drafting of noxious gases and smoke into the house. With inadequate combustion air, your central furnace or water heater can also backdraft toxic gases, even if the fireplace or stove appears to work properly. Some wood stoves draw outdoor air directly into the stove, ensuring an adequate combustion air supply and reducing unwanted infiltration. For a new home built to meet energy codes, an air inlet is absolutely necessary. Without proper design and consideration combustion air inlets can become problematic as well. For example if the intake happens to be on the downwind side of the house during severe weather there is a potential that air can get sucked out through it resulting in back drafting. 1 Source: Canada Mortgage and Housing Corporation (CMHC). A Guide to Residential Wood Heating , 2008 (About your House: Combustion Gases in Your Home, 2006; About your House: Efficient and Convenient Wood Heating, 2009). All rights reserved. Reproduced with the consent of CMHC. All other uses and reproductions of this material are expressly prohibited.